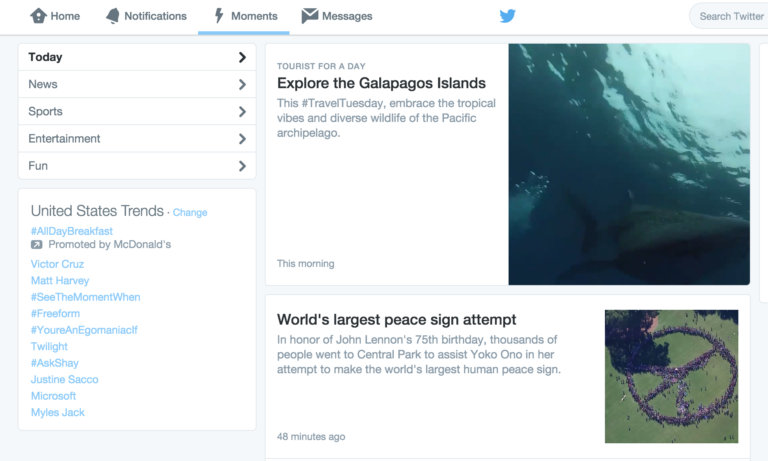 Twitter Moments has launched, delivering on a much wanted (and needed) functionality. Essentially, Moments aggregate tweets about a particular topic and allow you to follow that stream without actually following any of those accounts. You can also share that Moment in a tweet, or embed it on your website. That sound you hear was journalists rejoicing all over the world. You can see an example of what Moments looks like in the screenshot Matt took. There’s quite a bit to explore. There are several great ideas you can take away from this wonderful invention. Multiple Heads Are Better Than One – There are always multiple views of every event. Whether that’s what went down at happy hour last night or the latest political hot potato. If you want to get the full picture you need to hear from lots of different points of view. You Don’t Know Everything – It is impossible to know everything. Not even Google knows everything, although they’re certainly trying to rectify that. Look beyond your immediate vicinity to find new information. Explore. Learn. Grow. Sometimes, You’re Not The Expert – There’s a reason scientists do science. There’s a reason we have many happy clients. We’re all experts at what we do. Don’t pretend to be an expert in a topic you know nothing about. Being the conduit between an information seeker and the information holder is very valuable. Don’t underestimate the value of research. Fish Where The Fishes Are – Bad grammar aside, this is some sage advice handed down from grandfathers since time immemorial. Twitter is dividing its “fish” up into easily digestible bites and betting you’ll come to the gathered information. Wondering where to advertise or market to your audiences? Figure out where they congregate and go fishing. Regardless of these lessons, we’re pretty excited about Twitter Moments and to see how it can expose it to a new audience. Twitter has long been difficult to understand for new users, and this should help solve that learning curve. What lessons can you take from Twitter Moments?